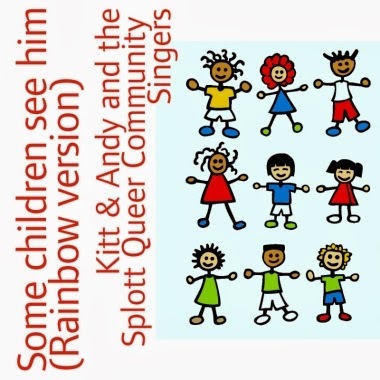 A Rainbow Version of the Christmas carol “Some Children See Him” was released today. It has a new straight/queer stanza added to the standard multiracial lyrics. “Some Children See Him” is a delightfully liberating song about how children imagine the baby Jesus looking like them. It has a verse for every race -- so why not a verse for every sexual orientation? The rainbow child of God. I live in Los Angeles, home of the recording industry, so it turned out that there was a way -- with the help of a mystery co-producer behind the scenes in true Hollywood tradition. My life partner Audrey and I are raw amateurs when it comes to singing, so it was rather embarrassing when we got the star treatment at the professional recording studio of a friend, who shall be known here only as Three-Turtle Man. But somehow it made sense because it was all for the cause of showing God’s unconditional love. The church has often excluded LGBT people from Christmas festivities, so we all made our best efforts in the spirit of Christ who was born in lowly circumstances to embody God’s wildly inclusive love for all. The Musical Advent Calendar is a fundraiser for Shelter Cymru, a charity for the homeless in Wales. Donations can be made at: http://uk.virginmoneygiving.com/andywills. Andy mixed both our voices into the final version along with heavenly synths, piano, strings, and maybe a bell or two. We are a truly international group, with singers from Wales, England and America. 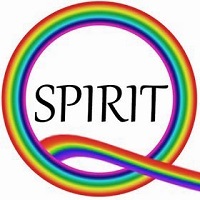 If you like our Rainbow Version of “Some Children See Him,” please consider making a donation for Jesus in Love, my project supporting LGBT spirituality and the arts, at http://www.gofundme.com/5mugns. Of course our unsophisticated singing isn’t going to outsell the famous James Taylor version. He croons the traditional lyrics on the following video with a wonderful variety of images showing Jesus from many racial and ethnic groups. Kitt, I enjoyed this. Perhaps you can allow a mp3 download. I'm looking at your lyrics and James Taylor's. I know the tune. It sounds very familiar. It is great to hear your voice, Audrey's and the folks from Wales! Merry Christmas!